Anyone can do it! Adults of all ages are beginning their training in Choi Kwang Do all over the world. 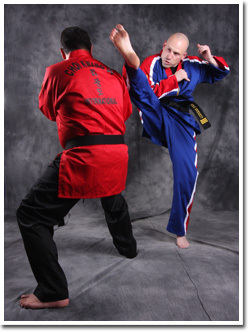 Choi Kwang Do’s primary focus is on overall physical and mental health and longevity, practical self-defense and street awareness. Students are challenged to set realistic goals for themselves and are given the encouragement and direction necessary to attain these goals. Every student will have the opportunity to join our assistant instructor program and train regularly with the president and founder of Choi Kwang Do, Grand Master Kwang Choi. Join today and discover the many benefits. Non-competitive – no sparring or tournament fighting. Emphasis is on personal success. Students excel at their own pace. Learn practical street self-defense, street awareness and avoidance tactics. Techniques are scientifically designed through the use of biomechanics, sports medicine, and kinesiology. Techniques are safe and follow the body’s natural range of motion. Classes incorporate yoga based stretching and abdominal breathing.